I belong to several creative groups on the internet, one of my favorites is ARTISAN WHIMSY [AW] which grew from a Facebook group called Creative Bead Chat. that caters to individual artists. 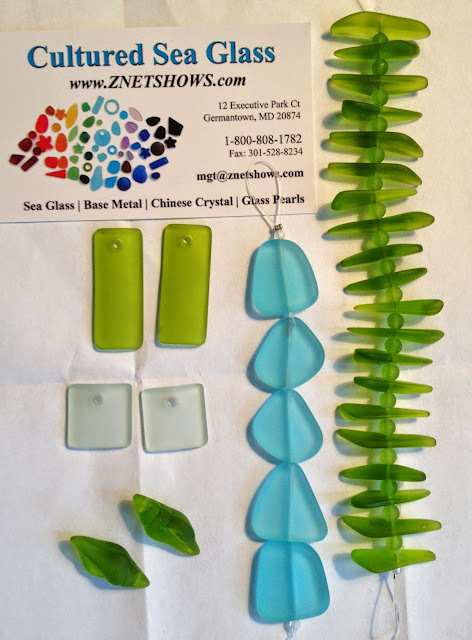 In this month's challenge I received the gift of 5 cultured sea glass /Beach Glass Beads components and you must create something with them and blog about it. A total of 5 artists receive the same pieces, then the fun begins. This glass is a feast for the eyes. This picture above shows what I received. I really liked the look and feel of this beautifully cultured sea glass. The colors were nice and rich and I was immediately inspired, especially by the aqua blue shapes. I have recently acquired a Swanstrom disc cutter and have also been experimenting with cutting, metal etching and embossing on copper, so I knew I wanted to incorporate some of these into my designs. I thought my biggest challenge would be the green stick glass. I have tried to use these shapes before, and I struggle with those center drilled holes. Happily, once I started laying things out on my board this seemed to fall easily into place. Using 20 gauge copper, I wired a few pieces together at a time. The 24 gauge sheet copper was cut with my Swanstrom and embossed using my Cuttlebug with a Vintaj folder. I patina-d with LOS and used a relief block, then dapped, hole punched and sealed the discs. 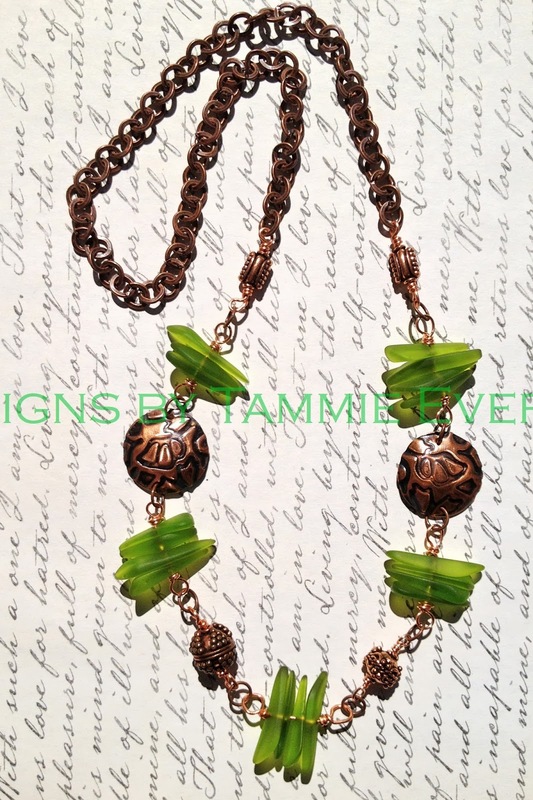 The copper accent beads and heavy gauge chain I had on hand worked well with this lovely shade of green, giving a rustic, earthy feel to this piece. These earrings also fell together easily. In this pair, the inspiration were the lovely deep green top drilled rectangles. I also used a couple of the small round spacer beads from the stick beads as an accent to my hand made ear wires. 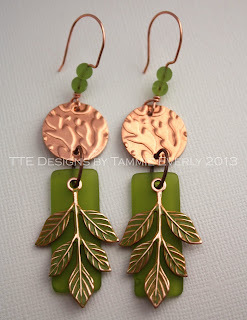 I cut and embossed the copper discs, but left them natural to age over time and used two leaf stampings from B'Sue Boutique which I altered with some Ranger Patina in moss green and a relief block. These are longer than my usual earrings and make a lovely jingling sound when worn. 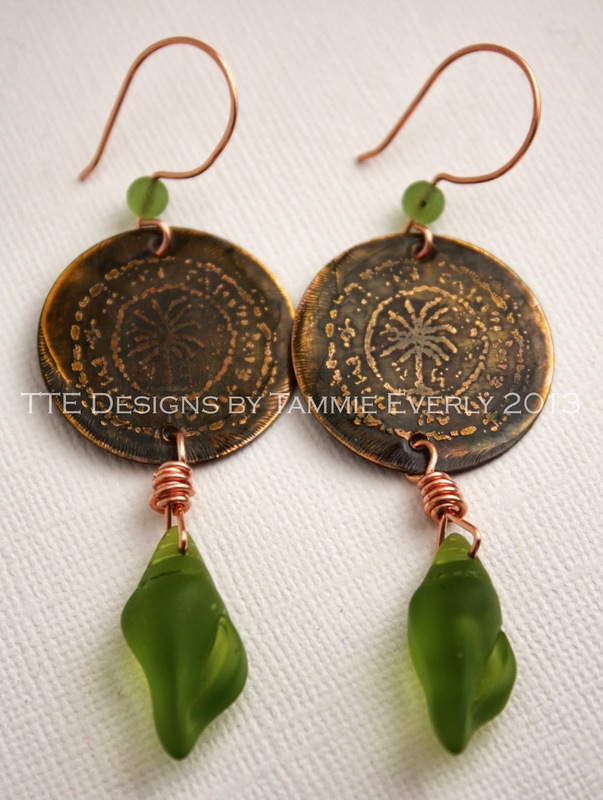 The second pair of earrings featured ZnetShows popular mini conch shell beads in green. These shapes really evoke tropical islands and were a perfect compliment to the palm tree discs I recently etched in copper. I patina-d the copper with a quick dip in LOS and also added a tint of green with Ranger alcohol ink in citrus. Again, I added a small spacer bead to the ear wire for a nice compliment. Now for the turquoise blue shapes I had found so inspiring. I had recently etched a seahorse figure onto a copper rectangle which I folded over to form the bail. I added some Guilder's Paste in 'Patina' blue to highlight the seahorse and add an aged look. 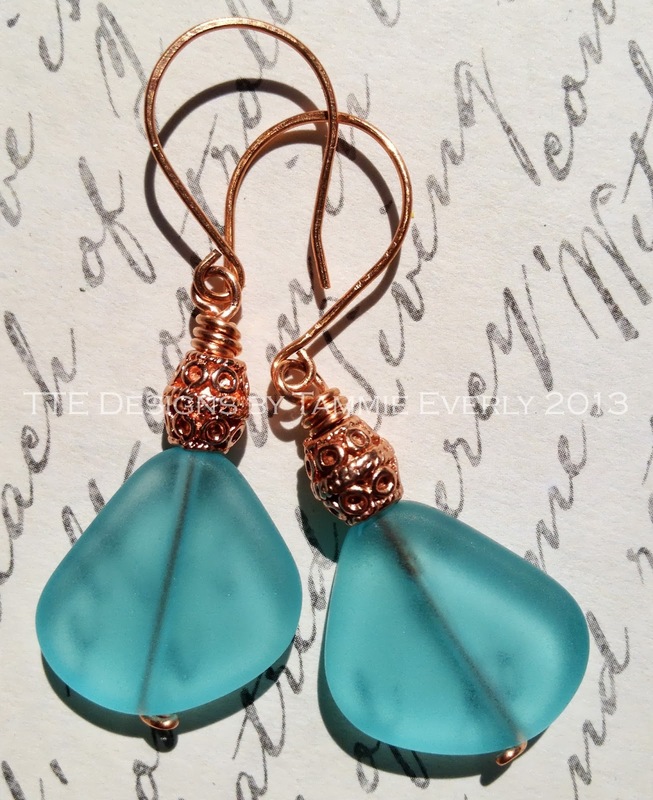 This would coordinate well with the aqua cultured sea glass. I decided on knotting some sari ribbon in a coordinating teal for a more bohemian look and added some wooden tube and copper barrel beads in a bright finish. As you can see by the picture, my focal bead at the base of the pendant cracked. I attempted to rescue/glue it but really I only succeeded in making the crack more obvious. I will remove it and change out something else [potentially taking apart the earrings, although at this point I am still undecided] but for this post I left it intact to show my original design concept. Lastly, I made these fun, modern concept "Jetsons' earrings. What's that? You don't remember anything in cobalt blue from the first picture? Well, you are right. Those two pieces of pale blue green 'coke bottle colored' glass sat on my table for days...... I tried multiple combinations with no success. I was getting really frustrated. A few weeks ago, I did a Thrifting Thursday post where I showed some small glass circles I picked up. 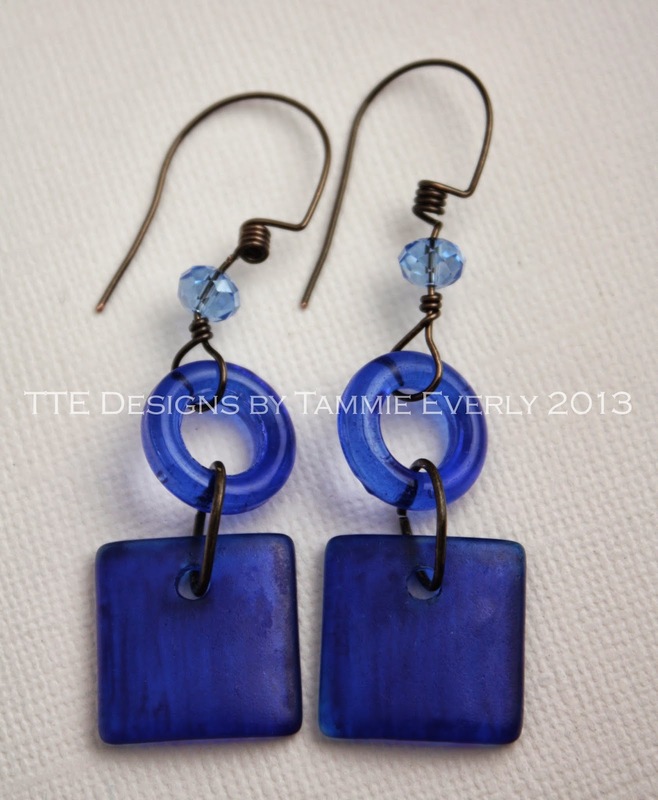 I loved the cobalt blue and kept trying to pair them with the sea glass squares... but they just didn't mesh. Also, I kept looking at the ZNETSHOWS business card on my table and all the beautiful colors that this "beach glass" comes in. So as I often do, I started tinkering.... and changed the color to a deep blue. The rest fell into place and I am pleased with the result. I'm not going to share what I did here because ZNETSHOWS has some fantastic cobalt blue cultured sea glass that you can purchase for yourself. Thanks so much to Melinda at Artisan Whimsy and Bill of ZNETSHOWS for the opportunity to participate in this 5x5 challenge and blog hop. I really enjoyed working with this high quality glass and would recommend it to anyone interested in working with a sea glass type product. Oh, we got the same sea glass pieces. Love what you did with yours. So sorry, your pendant piece fell and broke. You might be able to get Bill to send you another piece so you can keep the design intact. It's so fun to see how different people use the same beads. Just got my post up with my designs. I love what you did with the sea glass! Those earrings are adorable. I ran out of time to do anything with the shells, but I love that idea. The palm trees work perfectly with it. I have a couple of the blue pieces left. They are not quite the same shape as the one you cracked, but I'd be happy to send to you so you don't have to take the earrings apart. Thank you Shirley~ I know it's been a while~ I was wondering, if you still have a piece of that turquoise glass left? I am finally getting back around to fixing that set ......and I would happily send you something in trade for it. Let me know. I love the green and copper together. Well done designs! 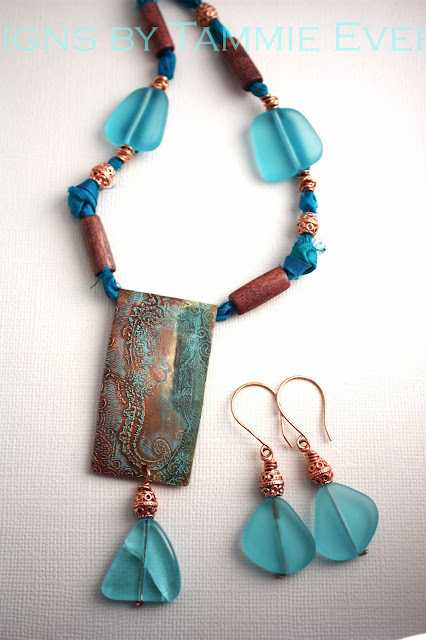 Love what you did with your beach glass beads and your etched copper is really wonderful with it too. Lovely, rich designs! I am absolutely in love with that deep green color! and you really did it justice! Really beautiful designs! 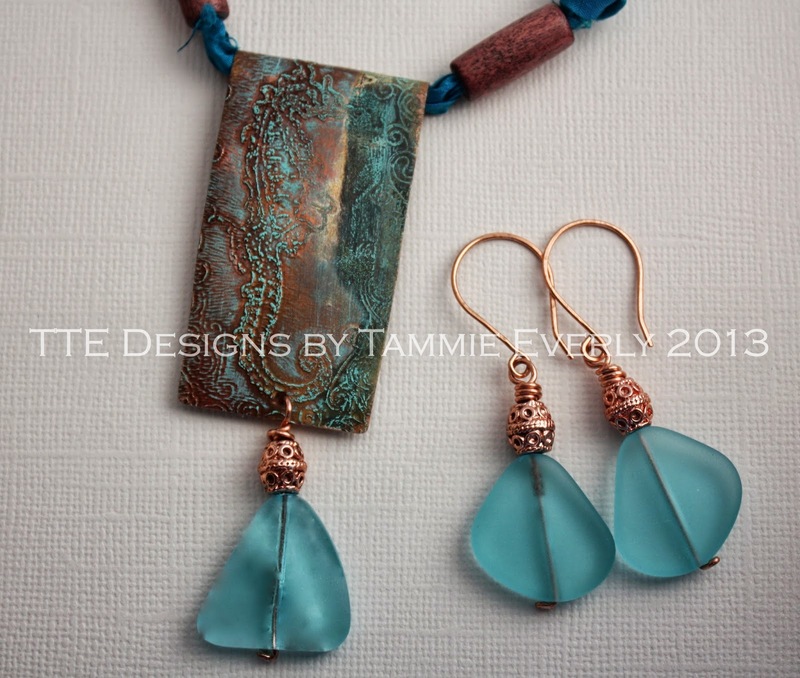 I love them all, especially the 1st necklace with the stick sea glass.